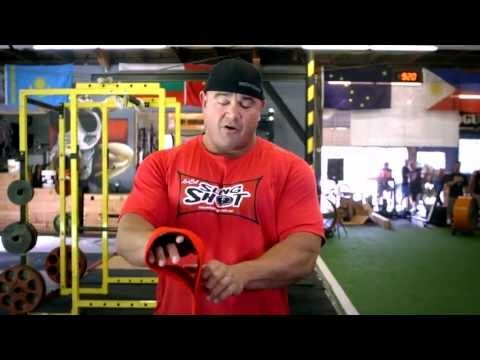 The Original Sling Shot will allow you to handle about a 10% overload in the bench press while avoiding the pain that comes along with pushing your body to the limit. It mimics natural muscle movement by lengthening and shortening with the muscles thus giving support on the eccentric and concentric phase of a bench press. This effect can greatly reduce stress on the shoulders, elbows, and chest. Use the Original Slingshot for benching, pushups or for assistance on ring dips and Muscle Ups. Please Note: If you are really tall (over 6' 4") or have especially big forearms, you need to order one size larger. Original Sling Shot is rated 4.8 out of 5 by 41. Rated 3 out of 5 by Jon M1208 from Too Small I must be oddly shaped or something because I seriously struggled to get the darn thing into the correct position on my arms. I weigh 210 so I ordered an XL. When I got it as low as I could, it wouldn't stretch enough to allow the bar to touch my chest. It stopped the bar about 3 inches from my chest. I messed with my form to see if it was something that I was doing but nothing helped. I would recommend sizing up if you're unsure of your size but it seems like I'm the only one that had this issue. Rated 5 out of 5 by Stalmad from I'm back in the game! I'm 51 years old and had to stop benching years ago because of shoulder pain. I am back in the game with my bench press after I was introduced to the Sling Shot several months ago! I'm up to a 360# 1RM now at 199 body weight. I absolutely love it. I use it for flat bench, decline smith, and heavy dumbell presses. I highly recommend it to anyone looking to take their bench press to the next level. Rated 5 out of 5 by Coach Rogers from Crush PR's This thing is incredible. Always had a strong deadlift and squat but bench has always been my downfall. It is mostly mental but this thing makes you feel solid and secure and keeps those elbows from flaring out when in a panic under heavy weight. Went from 315 for a double to a quadruple and maxed at 360 at 175 bw. Don't even Question it, get one! Rated 5 out of 5 by Gil M from Exceeded my expectations I did not have very high expectations from this but wanted to give this a shot because of the reviews I read online and oh I was wrong. My bench is my weakest link in my workouts and I have been able to move significantly higher weights (upto 45lbs heavier) using the sling shot. However keep in mind it is a workout tool and it does not make you lift that weight without it but still I was benching 185 without slingshot and 225 with slingshot in the beginning and after about a month of training with slingshot I can bench around 205 without the slingshot. In my opinion l, money well spent. Worth every penny. Rated 5 out of 5 by Alexonate from Mental hurdle conquered... Priceless I've been dealing with rotator cuff issues for over a decade. It affects the bench physically and mentally. SlingShot not only gave me proper form and stability to conquer the physical but also peace of mind to conquer the mental. Amazing product. Rated 5 out of 5 by BIGFARM from SLING SHOT I bought the Sling Shot "MAD DOG" a few months back and have used it a few times with my heavier sets and it truly does what is says. It help your form and gets you to be more explosive through your sticking point. Rated 5 out of 5 by Mmike62 from Original Slingshot I had torn most of my shoulder and Bicep. I could no longer bench except partial. At 56 i wanted to lift again. A power lifter i trained with had me bench with sling shot. One of the best things i bought. i cannot go over 135 without it as my arm flairs out and pain. With the sling shot im hitting 275 pain free.